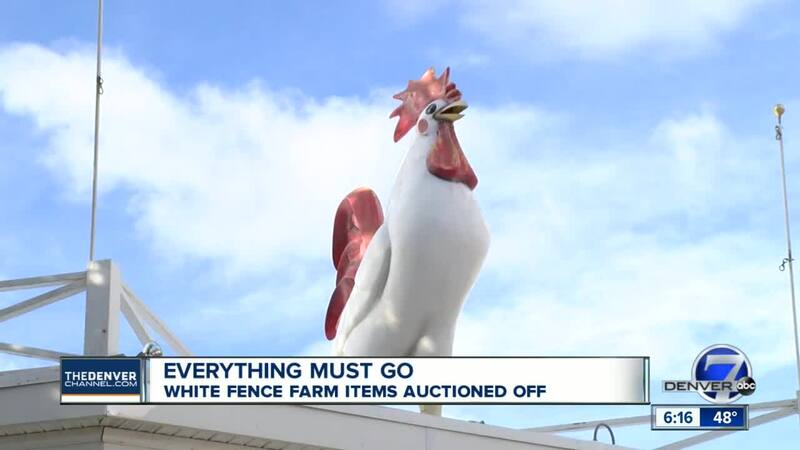 LAKEWOOD, Colo. -- You have the opportunity to get your hands on a piece of White Fence Farm history. The historic restaurant is auctioning items off after closing its doors in December. “A lot, a lot of stuff we have accumulated over the years,” said Whitney Carloss, Former General Manager of White Fence Farms. “Antiques, gift shop items, candy store items,” said Carloss. “All of the rocking chairs, the giant rooster on the roof. There have been a lot of people interested in the grandfather clock by our cashier area and the little humpty dumpty statue." The farm is also auctioning off kitchen equipment and dining room supplies that once seated and fed nearly 600 people. “We have all sorts of different chairs in here to the kitchen equipment to plates, silverware, trays, whisks, gravy earns, bus tubs; anything you need cutting boards, we have it,” said Carloss. Other items for sale include the fountain in the lobby, treehouse, gazebo and John Deere tractor. “We had a gentleman wanting to buy the slide out in the Americana Barn to put in his patio for his grandkids,” said Carloss.